My kids are good eaters. For the most part, they are not picky. They love Thai food, Italian, Chinese, and everything in between. What we discovered is that they do NOT like store bough BBQ sauce. Daddy has spoiled them. 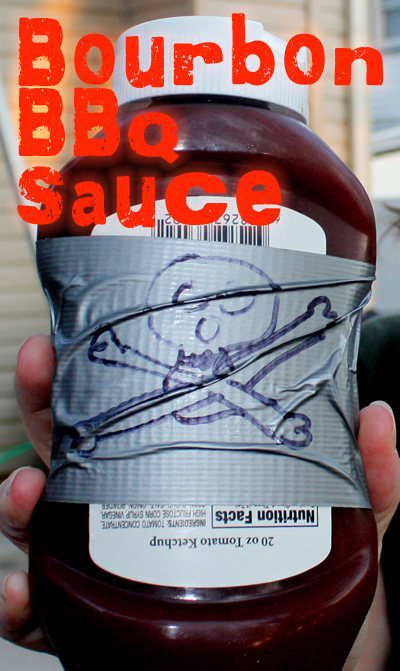 Below is the recipe for my bourbon BBQ sauce that they absolutely love. Yes, there is bourbon in it. No, my kids are not drunks. Most of the alcohol is cooked out of the sauce, plus I was always a big fan of the 1980’s PSA – “Don’t Drown Your Food“, so the sauce is always given out in moderation. That being said, it is scientifically proven that this sauce comes out better is you sip some whiskey while making it. Combine the first three ingredients in to a sauce pan over medium heat. Cook for 5 minutes or until the onions start to soften and turn a bit brown. Add everything else in to the pan. Turn up the heat until you see the sauce bubble (keep stirring so it doesn’t burn). Once it starts to bubble, turn the heat down and simmer for 15-20 minutes more, making sure to stir often. I use a silicone spatula to make sure the bottom doesn’t burn. There are a lot of sugary elements in the sauce, so keeping it from burning by constantly stirring is extremely important. Strain the sauce to remove the chunks. Your mother-in-law was my one of my college roommate, so if she gives it a thumbs up, that is good enough for me. Can’t wait to make it. She was famous for her goulash. Thanks Kathy! Let me know how it comes out.